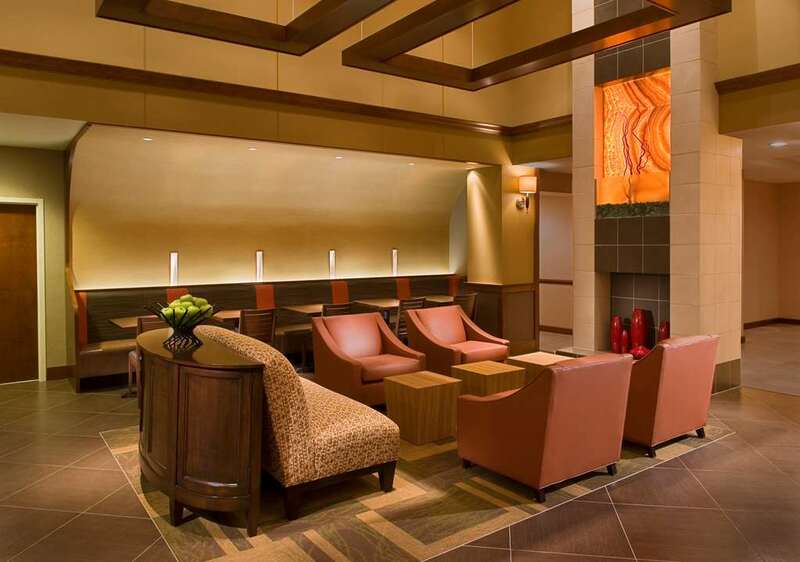 The Hyatt Place is a first class hotel located in the heart of Overland Park. Just off of Nall Avenue and I-435, the hotel is only a short drive from Kansas City and many attractions such as Worlds of Fun/Oceans of Fun, the Kansas Speedway, Arrowhead & Kauffman Stadiums and several shopping options. Hyatt Place offers a contemporary design, forward thinking technology and innovative food and beverage service. Rooms feature a 42" HDTV with Plug and Play technology, high speed WiFi, and Cozy Corners with 8 foot sectional sofa. Enjoy the day relaxing by our refreshing outdoor heated swimming pool or if you prefer to exercise, our fitness center will give you a great workout. Whether you are using the stair stepper, tread mill, or universal weight machine, you are sure to leave feeling pumped up! Extra amenities the hotel offers to make your stay more enjoyable include free and ample parking, complimentary local transportation 5 miles radius, free USA Today Mon-Thur, 1568 square feet of spacious and bright meeting space and much more. The Hyatt Place Overland Park Convention Center offers both business and leisure travelers a level of hospitality, comfort, and value that is hard to match! Pet Policy is 1-6 nights a 75 Non-Refundable fee. 7-30 nights a 75 Non-Refundable fee plus an additional 100 cleaning fee. Maximum of 2 dogs per room are permitted. Weight must be 50 lbs or less max of 75 lbs per room. Fees are in USD. Service Animals are exempt from fees. 15OCT15-18OCT15, The hotel has a 7 day cancel for Nascar. Located in the heart of Johnson County's business district. Hotel is centrally located to numerous corporate parks, restaurants, and shopping. Our location off of I-435 places us minutes away from downtown Kansas City, Kemper Arena, Bartle Hall, Jazz District, Country Club Plaza, Westport, Arrowhead Stadium, Kauffman Stadium, Worlds of Fun, and Oceans of Fun.